Slept a little late this morning -- didn't get on the road until 8:15 or so. (Can't imagine why I was so tired...) The first part of the drive through Idaho passed through a national forest, before US 20 veered off to the west and through agricultural land. The first real stop was EBR-1, the world's first nuclear power plant (built 1951). It's on a Dept. of Energy facility, part of the Argonne National Laboratories run by the University of Chicago. The only employee I saw on the premises was a college-age woman who was conducting a guided tour for two other people; otherwise, I was free to roam. Not too surprisingly, a lot of the exhibits stressed the safety of nuclear power; most of it was presented fairly, but a handout available at the end of the tour did conveniently downplayed the problems with storage of radioactive materials. From there, I continued on to Craters of the Moon N.M., a spot so isolated it wasn't even discovered until the 1920s. 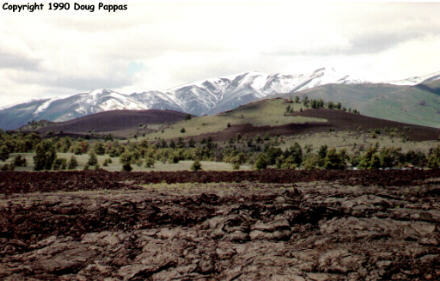 The monument preserves lava flows from between 2,000 and 7,500 years ago, in a variety of formations. I spent about an hour and a half wandering the area. Afterwards, there wasn't much else to do but make a beeline for Boise. At Mountain Home, US 20 merged with I-84; they stayed together until Boise, where US 20 wound through downtown, through a tacky, crowded commercial strip, and westward past Nampa, where I planned to stay for the night. Stupidly, I thought of taking a shortcut; this shortcut ultimately forced me to retrace my steps for the better part of 45 minutes. Nonetheless, I reached the motel at about 7:00 PM and stopped for the night.